Have you dreamt of getting married in a natural setting amongst wildlife? 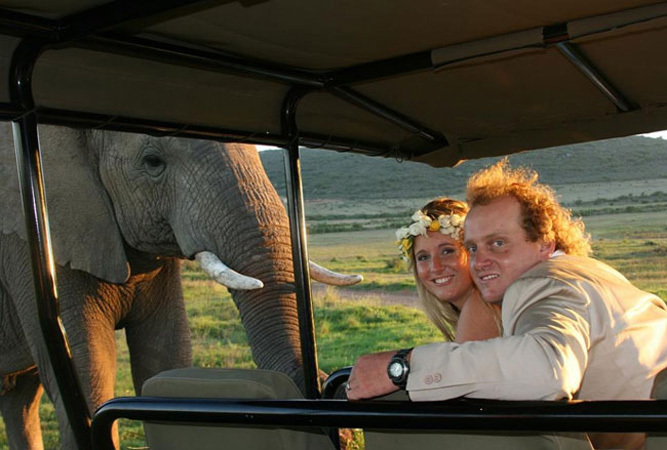 Have you pictured treating your wedding guests to an exciting game viewing drive but you can’t quite afford to get all your guests to travel to the Kruger National Park? 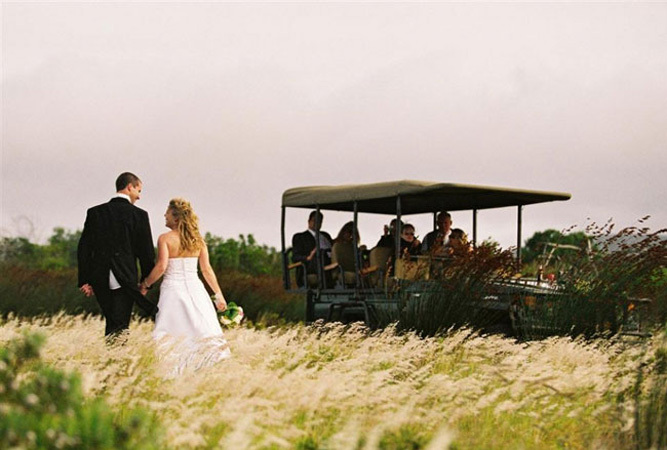 Then the Garden Route Game Lodge’s new Wedding Venue may be just the place for your dream wedding. Nestled on the edge of a breathtaking valley, Serengeti’s and the adjoining Labola Chapel provides a unique and romantic African setting for you to celebrate your special occasion. Architecturally designed to blend in with the surrounding landscape, the stylish new wedding venue at the Garden Route Game Lodge has been carefully constructed using natural materials such as stone, thatch, wood and glass and brings together the elements of earth, fire and water with taste and style. The new venue is equipped to accommodate 120 guests but can seat up to 200 guests with a dance floor. The expansive wrap around wooden decks allow your guests to witness the sunset over the majestic Langeberg Mountains and the star studded African night sky while the Serengeti Bar and Lounge are for your exclusive use. The venue is totally climate controlled throughout the year with 3 fireplaces for chilly winter evenings. Couples have the option of making use of the Labola Chapel or may opt for an open air ceremony on the wooden deck overlooking the valley below. Complimentary overnight accommodation in the honeymoon suite is included in the venue hire for the bridal couple to spend their wedding night. For additional information about having your wedding here Telephone +27 (0)28 735-1200 or visit Garden Route Game Lodge.